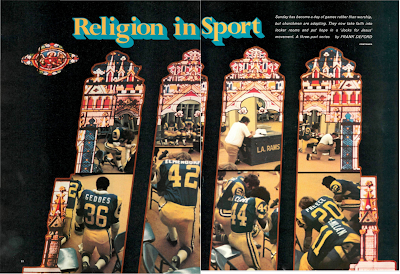 In 1976 Frank Deford wrote a three-part series for Sports Illustrated on "Religion in Sport." Deford focused special attention on what he called "Sportianity." This world of sports-specific evangelical ministries included the Fellowship of Christian Athletes, Athletes In Action, Baseball Chapel, and Pro Athletes Outreach, and was represented in Deford's piece by coaches and athletes (Roger Staubach, Alvin Dark, Tom Landry), sports chaplains (Billy Zeoli, Tom Skinner), and organizational leaders (Arlis Priest, Dave Hannah). Although Deford also discussed Catholics, Muslims, and Jews, his digressions into non-evangelical groups were usually meant to serve as a contrast to the deficiencies of the Sportianity style. In Deford's view, the leaders of Sportianity were so obsessed with the "competition for dotted-line converts" that they ended up captive to the world of big-time sports. They were, Deford concluded, "more devoted to exploiting sport than to serving it." Mainstream media, including the New York Times, had taken note of the prominence of evangelicals in athletics before Deford, but no major journalist had so thoroughly dissected the phenomenon. The series caused a stir, especially among those associated with evangelical sports ministries. NFL linebacker-turned-evangelist Bill Glass, for example, opined that Deford's series was "the biggest pile of garbage that has ever been perpetrated on the American public." Others took a more sympathetic view. Gary Warner, editor of the Fellowship of Christian Athletes' monthly periodical, thought that Deford may have been unfair in some of his characterizations, but that many of his critiques hit the mark. I was talking about Deford's series recently with Art Remillard (hey, did you know Art is writing a "religious history of sports in America" and is also blogging about it?). Art pointed out that this year is the fortieth anniversary of Deford's essays. So, in the spirit of arbitrarily commemorating things in ten-year increments, I decided to go back and reread the Sports Illustrated series. Here are four things that caught my attention. (1) Deford does a pretty good job of mapping out the world of evangelical sports ministries. He manages to discuss most of the major organizations and picks up on important developments, like the explosion of pre-game and post-game team prayers and the rise of sports chaplains. Of course, with the benefit of hindsight and four decades of scholarship on American religion and sports, it's easy to pick out his deficiencies. But as a journalist trying to make sense of a particular mid-1970s moment, Deford did quite well. (2) There's definitely a 1920s H.L. Mencken streak running through some of Deford's characterizations. He notes, for example, that while the "sophisticated" areas of the country reject Sportianity, the movement thrives in the "essentially fundamentalist" Bible Belt. As for what Deford means by "fundamentalist," he seems to equate it with the view that "[t]he Bible is to be taken literally. The message is simple, all or nothing; there is no truck with intellectualizing, the appeal is gut." At another point in the series, Deford is shocked to discover that leaders of evangelical sports ministries do not want affiliated athletes to watch X-rated movies or stay in hotel rooms with their girlfriends. "One is reminded of Jonathan Edwards, the Calvinist minister, who spearheaded the Great Awakening in 18th-century America," Deford writes, "...Edwards was known, at least until now, as 'the last medieval American.'" Along with turning to well-worn stereotypes about fundamentalists, Deford occasionally relies on the trope of superstitious Catholics when describing pre-game rituals. But Catholics are generally presented in a positive light; they are certainly preferable in Deford's mind to the "humorless" and "churchy" fundamentalists. Heavenly Father, Divine Goalie, we come before You this evening to seek Your blessing.... We are, thanks to You, All-Stars. We pray tonight for Your guidance. Keep us free from actions that would put us in the Sin Bin of Hell. Inspire us to avoid the pitfalls of our profession. Help us to stay within the blue line of Your commandments and the red line of Your grace. Protect us from being injured by the puck of pride. May we be ever delivered from the high stick of dishonesty. May the wings of Your angels play at the right and left of our teammates. May You always be the Divine Center of our team, and when our summons comes for eternal retirement to the heavenly grandstand, may we find You ready to give us the everlasting bonus of a permanent seat in Your coliseum. Finally, grant us the courage to skate without tripping, to run without icing, and to score the goal that really counts—the one that makes each of us a winner, a champion, an All-Star in the hectic Hockey Game of Life. Amen. But Deford himself can't resist doing something similar (albeit without the cloak of religious authority and with the benefit of his deft writing style). Thus, he talks about Tom Landry and "his assistant pastor, Roger Staubach." He describes Athletes In Action's decision to wait for Terry Bradshaw to mature before deploying him as an evangelist as "redshirting" him. Deford also launches into an extended digression about how baseball is organized like the Catholic church, with a "commissioner-pope," "owners-cardinals" and "fans-parishioners." And he concludes his series with a line lamenting the negative influence that sports have on religion: "It might be a good idea right now to talk to the veteran GM in the sky about the possibility of a rebuilding year." (4) While the world of Sportianity that Deford describes is still recognizable today, much has changed. Perhaps the most dramatic change has come from the growth of women's sports. As Annie Blazer points out in her excellent book (reviewed here), more women than men are now involved in evangelical sports ministries. In Deford's series, women only show up as wives and/or sexual objects (one term Deford uses is "stadium lizards"). A second major shift has been the growth of evangelical sports ministries into professional basketball. Deford shows that sports ministries in the 1970s were most prominent in professional football ("the heart of the Sportian movement") and professional baseball. In 1976, for example, nearly every NFL and MLB team had regular chapel services and team chaplains, and MLB commissioner Bowie Kuhn even served on the board of Baseball Chapel. In contrast, only one team in the National Basketball Association (the Atlanta Hawks) had a team chaplain. In the 1990s, however, chaplain services became increasingly institutionalized in the NBA. As Sam Amick documented in 2014, they have become a central, albeit sometimes divisive, part of NBA locker rooms, In fact, the biggest news to come out of the NBA this summer -- the decision by star forward Kevin Durant to leave his team in Oklahoma City and sign with the Golden State Warriors -- revealed the newfound pervasiveness of Sportianity in the NBA. According to ESPN reporter Ethan Sherwood Strauss, Durant first connected with his now-teammates Stephen Curry and Andre Igoudala in 2010 when the three played on Team USA. That summer they bonded over basketball and religion, regularly attending chapel services together. The relationships they forged during that time set the stage for Durant's decision to join Igoudala and Curry on the Warriors. One final shift relates to changes in the national political context. Deford recognizes the "God and country" themes popular among Sportians, but his essays appeared before the Religious Right emerged as a major political force. In the decades since 1976 sports ministries like FCA have often joined forces with the conservative political activism of the Religious Right, a theme that Tom Krattenmaker picked up in his 2009 book Onward Christian Athletes. At the same time, however, FCA and other sports ministries tend to be decentralized, allowing for a greater on-the-ground diversity of opinion and approach than critics often realize. And because of the unique world in which sports ministries operate, they tend to be much more racially diverse than most churches and religious organizations. This seems to be shaping the political engagement of some sports ministries: Athletes In Action, for example, recently published a piece in support of the Black Lives Matter movement. And AIA has not confined itself to speaking out on racial justice. Ed Uszynski, a key leader in the organization, recently took on the Baylor football sexual assault scandal. "[W]hat if collectively we’ve already given away our soul?" Uszynski wondered, before discussing "cultural realities that virtually guarantee another scandalous athletic department cover-up is coming our way soon." That the Baylor football scandal occurred at a Christian school and under the watch of a self-professed Christian coach who spoke publicly about his faith reveals the continued relevance of Deford's critiques of Sportianity. On the other hand, the reaction of Athletes In Action suggests that, for some Sportians at least, Deford's critiques have been taken to heart. When Deford published his Sports Illustrated series in 1976, Sportians temporarily felt the sting of rebuke, although it did little to slow their growth. But if evangelical sports ministries have lived on, so too have Deford's essays. For scholars studying the intersection of American Christianity and sports in the twentieth century, Deford's trilogy continues to be required reading. And the term he coined forty years ago -- "Sportianity" -- stands today as a well-understood shorthand among sport historians for the rise of evangelical sports ministries in the post-World War II era. Part one: "Religion and Sport"
Part two: "The Word According to Tom"
Part three: "Reaching for the Stars"